You are currently browsing the category archive for the ‘Hummingbirds’ category. I love hummingbirds. I have a few that hang out by my house, I feed them all summer long (they’re a little spoiled – I use filtered water and usually add extra sugar to the mix). I even downloaded an app from the Audubon Society to track the hummingbirds that come to my feeders, but since it’s the same birds day in, day out, I stopped the updates. I haven’t stopped enjoying the birds, however. They’re going to be leaving in a few weeks. The other day, I realized I hadn’t appreciated them this summer as much as in summers past, so I spent a little time chilling by the feeders with my camera. It was around sunset on a beautiful evening in Albuquerque, and it didn’t take long for one of the birds to come for a drink. I thought it’d be nice if I took you along on the journey with me. To get the full experience, you should keep in mind that even though I see these same birds every day, I still get excited to see them. So it’s best that you fidget in your seat when you scroll really, really fast. Did you feel like you were there? I’m sure you did. I’m gonna miss those little boogers when they’re gone. There’s still time to guess the plant puzzler, in which I asked if this plant was real or fake? If you think you know the answer, leave your best guess in the comments section or on my facebook wall. The deadline is tonight at midnight MST (that’s 2am EST). I’ll reveal the answer and the winner(s) tomorrow after an all-new Ask the Experts panel. Imaginary prizes will abound. Hope to see you back here. 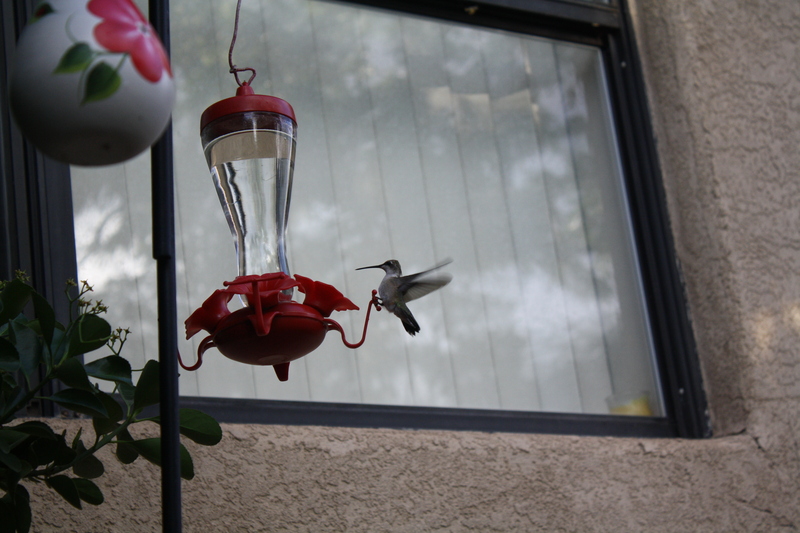 I’m not mad that the hummingbirds left without saying goodbye again this year. I’m a little relieved to have a break from refilling the feeders once a week. Still, I’ll miss those little boogers. The other morning, I was doing a little yard work and enjoying the morning air. A pair of hummingbirds chased each other through the sky. One of them kept coming over to say hello to me. I think he looks like he’s dancing, don’t you? Well, they did it again. The hummingbirds left town without so much as a goodbye. One day they were here, enjoying the fresh nectar I provided, the next they were gone. No goodbyes, no see ya next year, no thanks for feeding us all summer. I’ve got the feeders filled in case any stragglers come by, but I’ll be taking them down in a couple of days. And even though the birds didn’t say bye, I’ll still put the feeders out next May because they’re pretty good about saying hello. Most of you know how charming I find bird enthusiasts to be. Birding is one of the few activities remaining in our society that’s still based on the honor system. How cute is that? The nest is deceptive. The hole is shallow, the bulk of the nest is solid. It’s like 10 times the amount of space they actually use. Baby hummingbirds! I wasn’t sure what I was seeing when I first looked at this photograph, so I asked George about it. 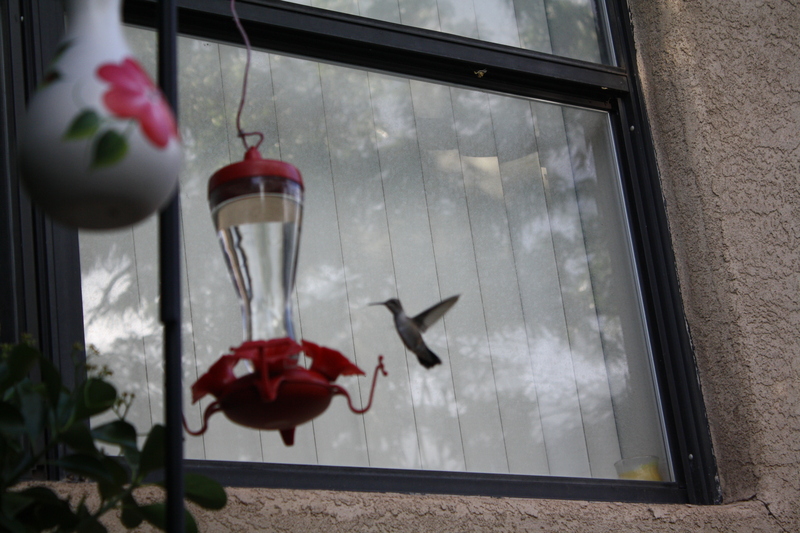 He said the mama hummingbird trusted him enough to let him get a few shots of the babies. That’s awesomely cool. Apparently Jeanette has to refill the feeders. All. The. Time. Love ’em! 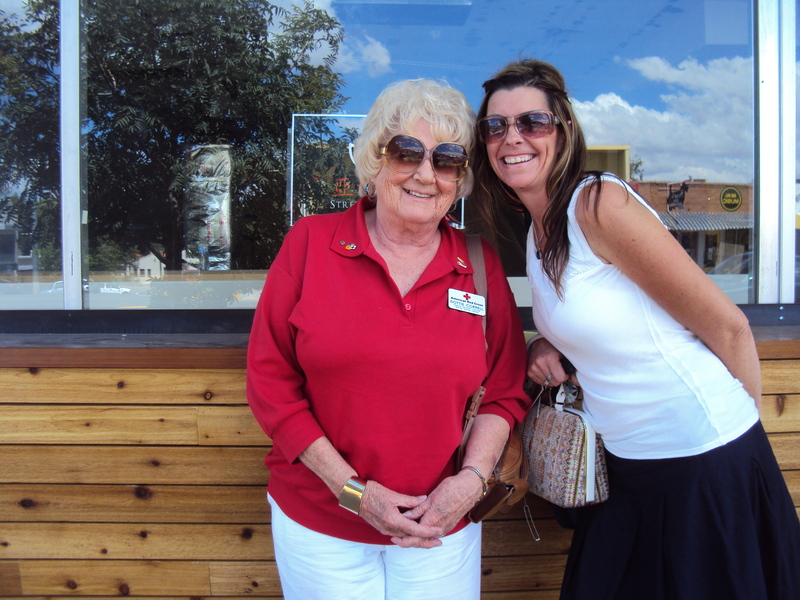 Thanks so much for sharing your photos! My experts will be back manana. We’re going to be talking about the monsoon rains, so I hope you tune back in to hear what they have to say. I’ll also have a new plant puzzler for you. See you then! I feel so, well, used! I mean, I fed them all summer. Good, filtered water, lots of sugar. Then they can’t even be bothered to say goodbye before they leave? Some manners, sheesh! Hi hummingbirds, and happy Wednesday! Usually on Wednesday, I have an edition of the Plant Lady Chronicles. Today, however, I’m going to digress from that to show you some friends of mine. Goatheads have made a remarkable comeback in my garden, so I’ve been spending a lot of time outside pulling them. 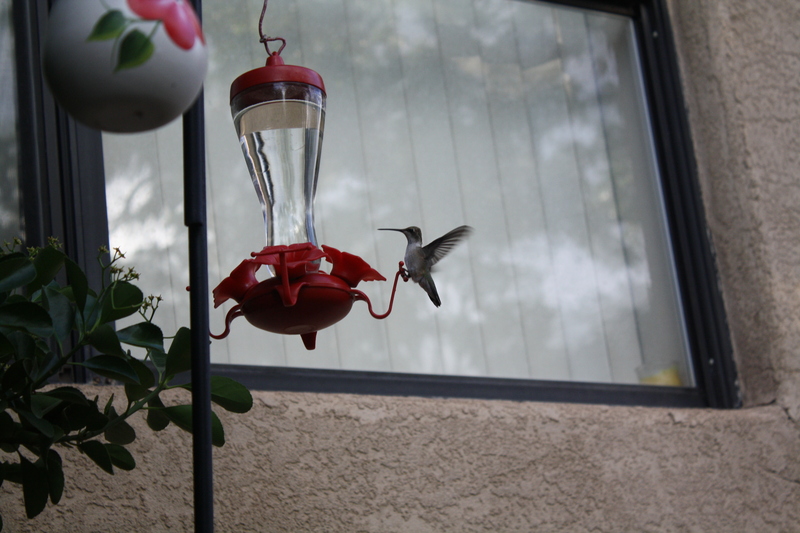 The other day, I had my camera with me because a couple of hummingbirds were buzzing all over the place. So cute! Even without her sunflower head, Dottie is adorable. Welcome home, Dottie, you were missed!